We all love Millennials. They’re the future main stream restaurant consumers. They do all sorts of cool things like Foursquare, Twitter and Yelp (at least they did last week). They like to try new things. And, they’re just inexperienced enough to be optimistic. BUT, they have not been immune to the effects of the great recession and its aftermath. They’re still pretty broadly unemployed. As of June 2012, the U.S. unemployment rate for the total population age group of 18- to 19-year-olds was 22 percent; 13.7 percent of those ages 20 to 24 were unemployed, and the rate was 8.2 percent for ages 25 to 34. Caught in the middle of this country’s economic turmoil, these young adults have consistently cut back on their visits to restaurants in the past three years, according to NPD’s CREST foodservice market research. 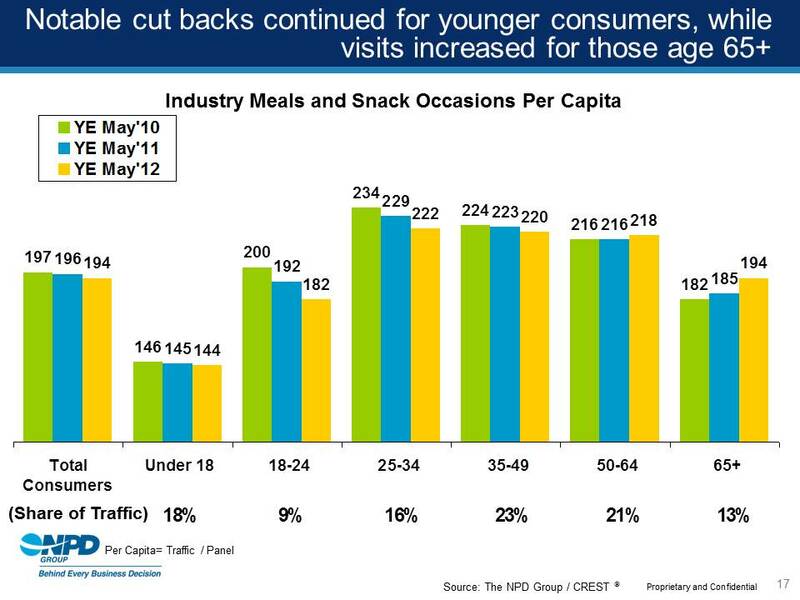 Yet in spite of their economic hardships, Millennials still managed to make 12+ billion visits to foodservice establishments in 2011, spent $73 billion on foodservice meals and snacks, and remain the heaviest restaurant users among all age groups. And, to the degree that they carry on and remain optimistic, perhaps it’s a belief that it can’t get any worse.